....otherwise known as Leonard Cohen, whose visit I was looking forward to so much more than that of the other guy whose last name begins with the letter "C". 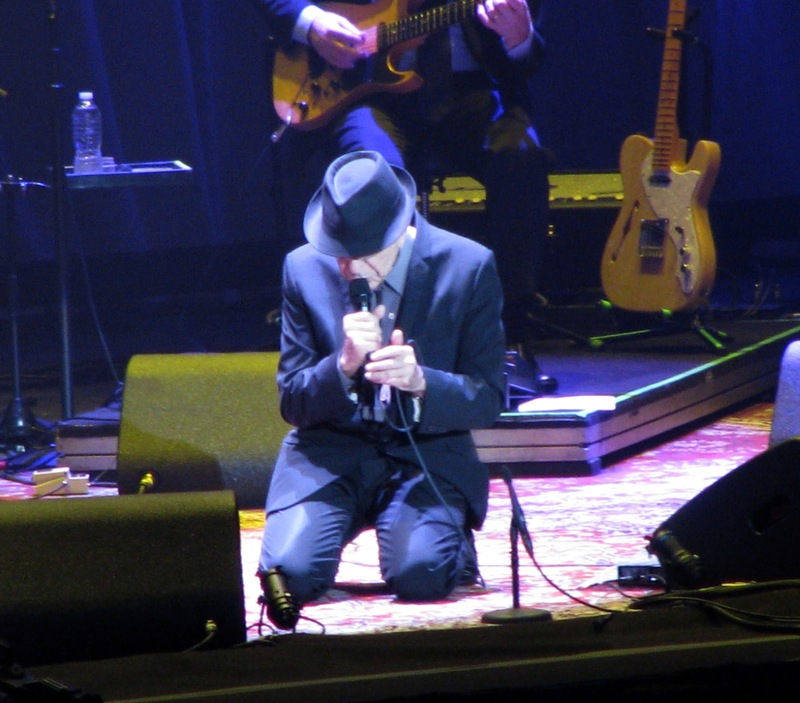 Revered Canadian poet and singer Leonard Cohen, who was inducted into the Rock and Roll Hall of Fame in 2008, is blessed with a marvelous baritone voice and a large repertoire of rather bleak songs that combine the religious and the sexual. Backed by a stellar group of musicians and backup singers, he entertained his London fans for over three hours with songs from recent albums, and old favourites like "Chelsea Hotel", "Suzanne", "Hallelujah" and "Bird on the Wire" - it was a Leonard lovefest all around. Sadly, I was sitting rather far from the stage, and as I don't have a gigantic lens for my camera, I had to settle for the least blurry shots I could capture. Mr. Cohen had stopped touring back in 1993, and then his life took a very unfortunate turn in 2004 when his longtime business manager absconded with Cohen's life savings while he was at a Zen Buddhist monastery. He was forced to go back on the road in 2008, at age 74, in order to pay his bills. What was a devastating situation for him turned out to be a bonus for his fans, as he has been playing packed venues for the past 4 years, presenting a show that would be an endurance test for a performer half his age. The years in the Monastery obviously kept him flexible, as he alternated between standing and kneeling, and there was never any sign of a struggle getting from one position to the other. His concerts are precisely choreographed, from the backup singer's movements to the between-song patter, so there are no surprises, but that also means no disappointments either. My personal highlight of the night was when he recited his poem from 1998, "A Thousand Kisses Deep". 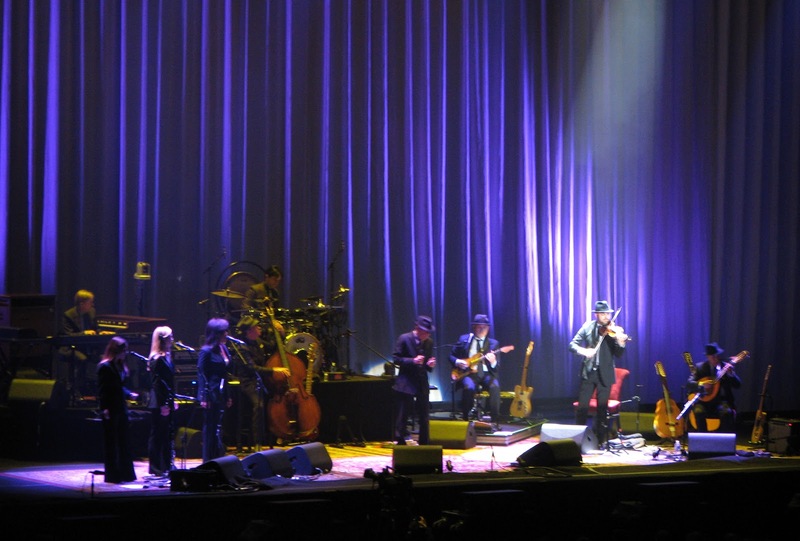 Cohen is extremely generous in his praise to the members of his band, whom he introduced twice during the evening and several times doffed his hat to them. They are a multi-cultural mix of some of the most talent musicians that a singer could wish for, including acoustic flamenco style guitarist Javier Mas, violinist Alexandru Bublitchi, Hammond player Neil Larsen, and electric guitarist Mitch Watkins, pictured above. 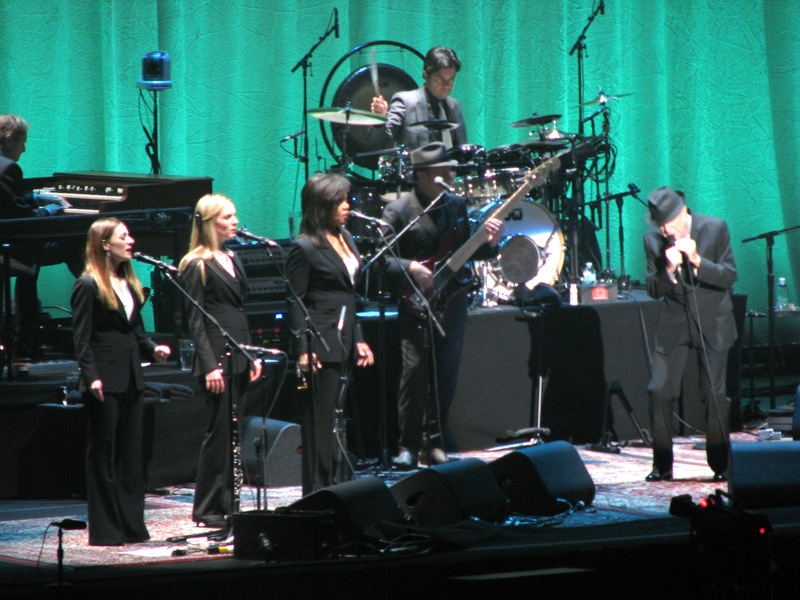 Cohen has a wonderful trio of backup singers who accompany him for all his tours. 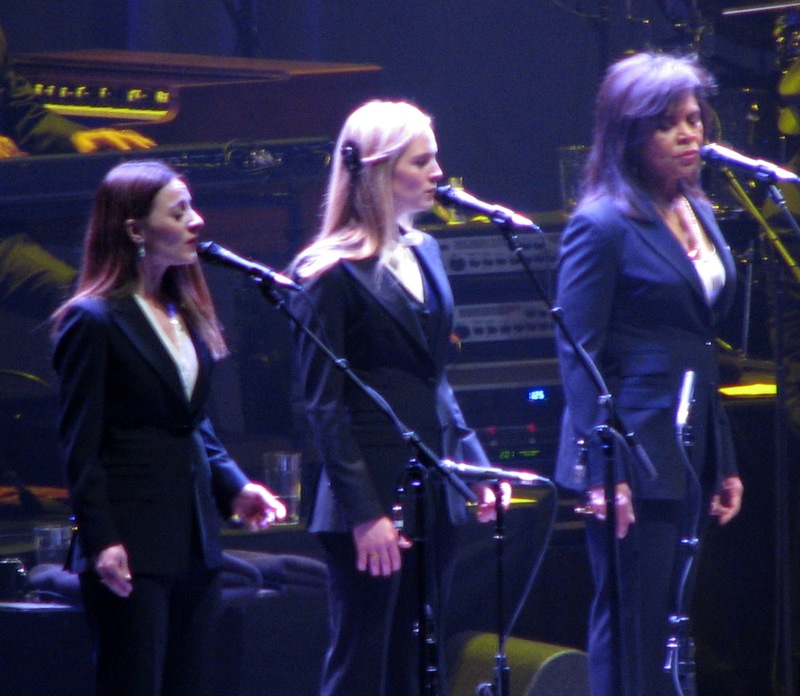 The two women on the left are the fabulous Webb Sisters, Hattie and Charlie, and Cohen's longtime collaborator, Sharon Robinson, far right, who sang a solo during the evening. 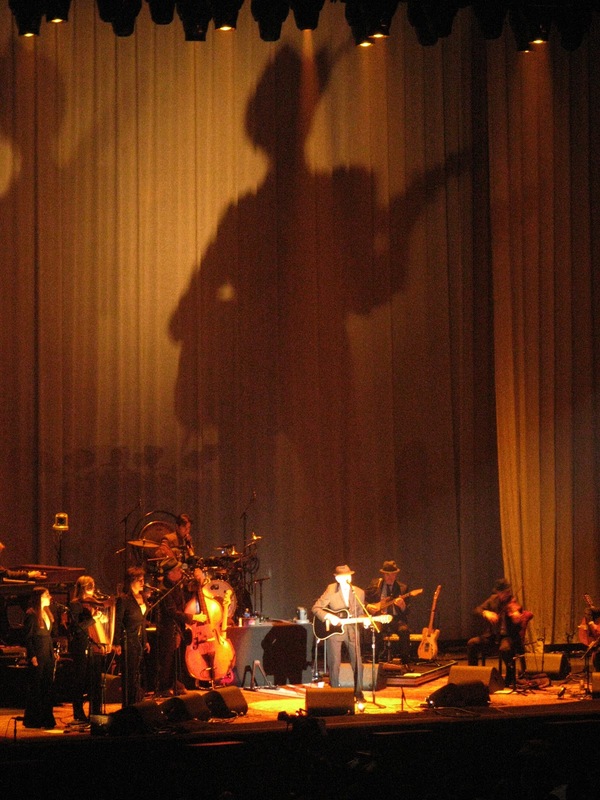 When Cohen, playing guitar, sang his classic, "Suzanne" in front of a gigantic silhouette of himself, the floor was lit by a host of LED screens of cell phones raised to capture the moment. You know you're old when you can remember when people use to do this with cigarette lighters. 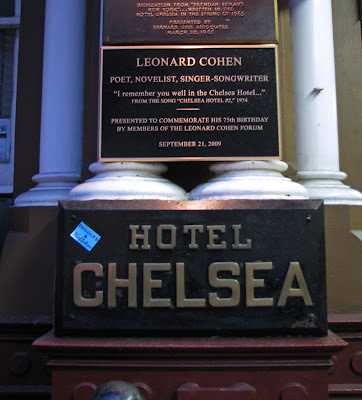 One of the highlights of my trip to New York last year was stopping by the Chelsea Hotel and seeing the plaque that had been erected in recognition of Leonard Cohen's 75th birthday. And finally, what I wore - a hat was necessary, as a tribute to Mr. Cohen, who always wears a suit and a fedora when performing. A friend who took this photo noted that I was in full "1980's MuchMusic VJ" (think Erica Ehm and Ziggy Lorenc) mode. That looks like a wonderful concert and a great evening. 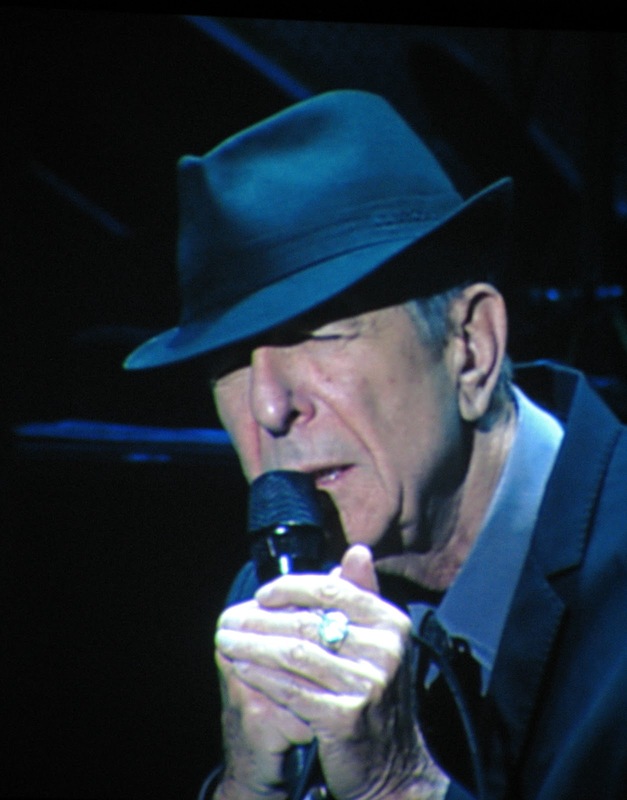 I love Leonard Cohen, what a fabulous voice he has. Oh I would have loved to been there. You look fab as usual. 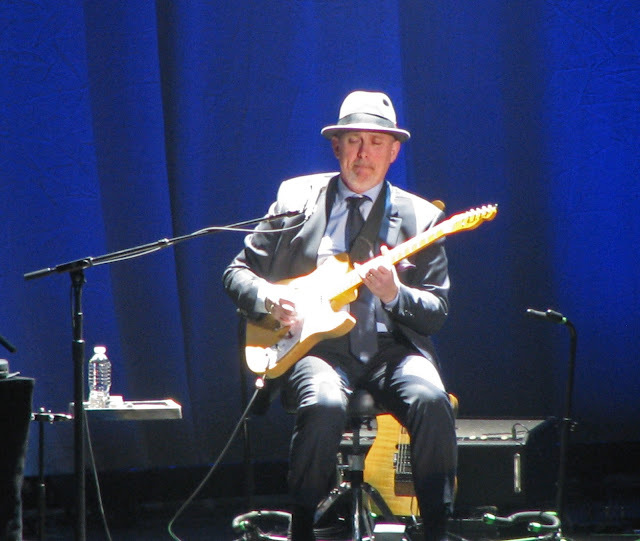 The only photo I shot off the Jumbotron was the closeup of Mr. Cohen's face; the rest were taken from the stage. I was amazed that any of them were in focus. Shelley, what a great review of an icon's performance. 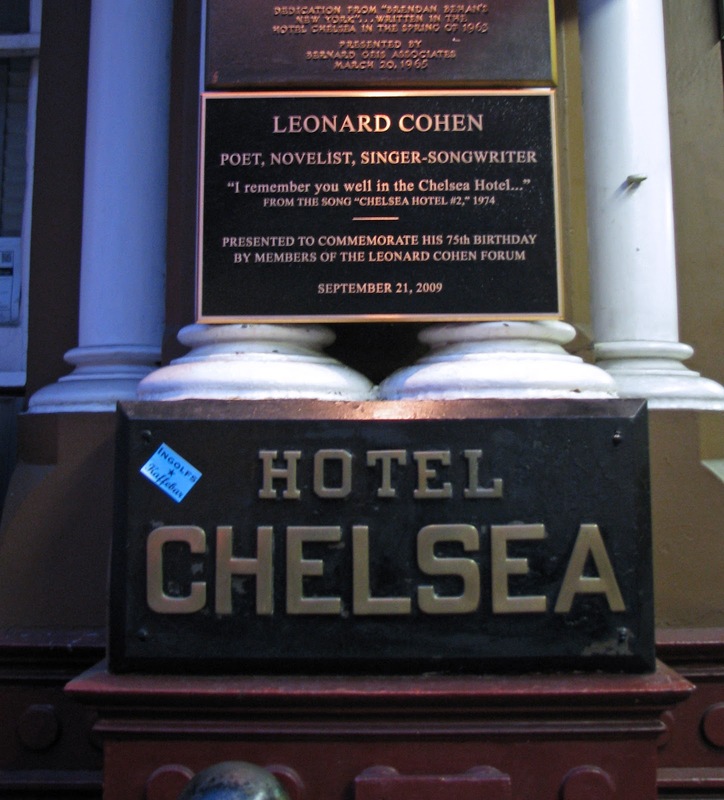 I remember you taking me by the Chelsea Hotel and pointing out the plaque honoring Leonard Cohen. 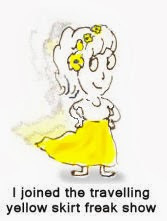 Your outfit is smashing for the event with your creative pattern mixing and your hat with a touch of veil. 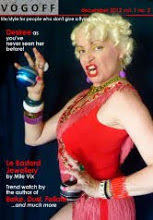 I'm sure that you turned many a head at this visit by St. Leonard! What an awesome concert it must have been Leonard Cohen is mazing! 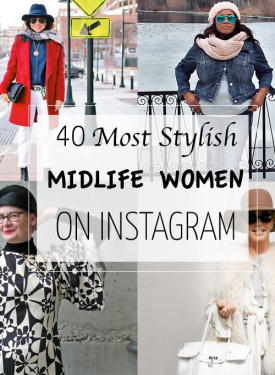 Love your outfit--you are rockin the dots and that cute hat! You have outdone yourself, my dear. 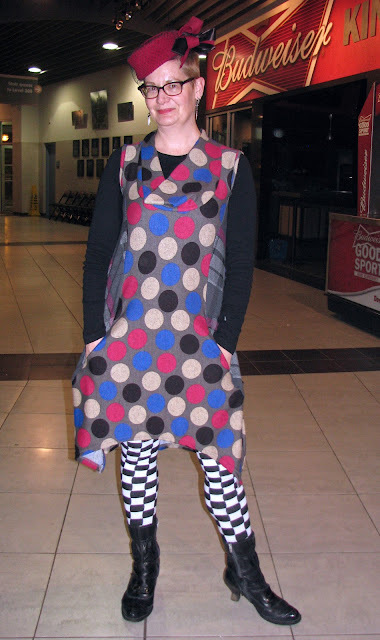 Love your concert outfit - so wonderfully eclectic, just like its wearer! Fabulous hat and boots and I love the pattern mix - fantastic outfit! Glad to hear it was a transcendent concert experience. What a sad story about his loss of fortune and the person he probably most trusted in the world. Just awful. I recently heard him on the radio and wondered how he could still sound so darn good after all these years. This is quite a thrill to see him on your blog like this. Sure wish I'd been there and done that! Great voice, I am going to see him tomorrow in Tampa.. i am a little bit disappointed that he don't sing the original song with its﻿ lovely tune in the show. i was waiting to hear it..
Wow! Looks like it was a fun night! I can imagine how great the feeling it gives in hearing and watching the great Lenard Cohen perform!